Compression, a go-to tool when mixing vocals, is commonly used to treat the dynamics of the artist, as there are times when the performer can be really soft and then very loud. But not all compressors treat vocals equally. Most compressors are what's called full-band compressors, which operate by attenuating the entire signal as a whole determined by the threshold, regardless of its frequency content. There are ways to compress certain bands more than others, depending on how you set the threshold, ratio, attack and release settings, but overall it will just compress according to what the loudest part of the signal is—and compress it uniformly to get a more even level. Equalization is a second go-to tool for vocals, but it has its limits. It can be easy to overuse—making a voice sound unnatural. But even when not overdone, it can be difficult to make EQ sound neutral, especially in moments when the performer changes their volume or pitch. 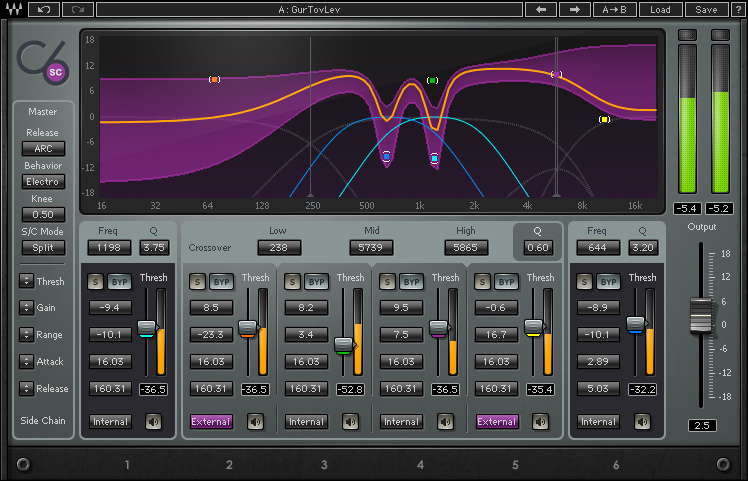 Of course, you can get great vocals by combining a full-band compressor to tame the dynamics and EQ to shape the tone. But what if there was a way you could compress and EQ all at once, in a way that results in an overall more natural sound? There is! Multi-band compression. Multi-band compression has actually been around for a few decades, originally in the form of hardware units that were a tad tricky to set. Now that they are available as plugins, they are easier than ever to access and use. (Not to mention you can use as many in a session as your CPU allows.) So what's so special about this multi-band compression, and how can it serve as both an EQ and compressor at the same time? Let's delve in by looking into an example scenario. Let's say you have a singer that you want to mix. In this hypothetical song, the singer starts out the verse using a soft low pitch, then as they progress they get louder and also go up in pitch. In those moments, you notice their voice becomes harsh in the upper mids (let's says around 2500Hz). Now, the traditional approach would be to pull up an EQ, sweep around til you find that frequency then apply a small cut in that area. The problem with this, however, is that now the area in the beginning, when they were singing low and soft, sounds extra muffled because that area did need that 2500hz. So then, while listening to that first soft, part you realize that there is just too much muddy buildup at 350Hz, so you make a cut. Then you go back to the high part again, and realize that because you made that cut, the vocal now sounds thin, because when they shifted up in pitch, the warmth and body of the vocal that was around 200Hz to start shifted up to 350Hz, which is now cut. And that muddy buildup that was at 350Hz when when the singer was in a lower pitch is now muddying up around 500Hz. You see the conundrum here: The problem areas change throughout the singers performance, so doing one cut may have worked for one part, but created problems in another. Another way to look at it, aside from frequency variation, is if an artist is moving around on the mic too much. During some parts, they may be close to the mic, creating a boomy proximity effect. During louder parts, they be far away from the mic, resulting in a less boomy sound. So if you cut that boomy frequency range, those louder parts will then start to sound thin. 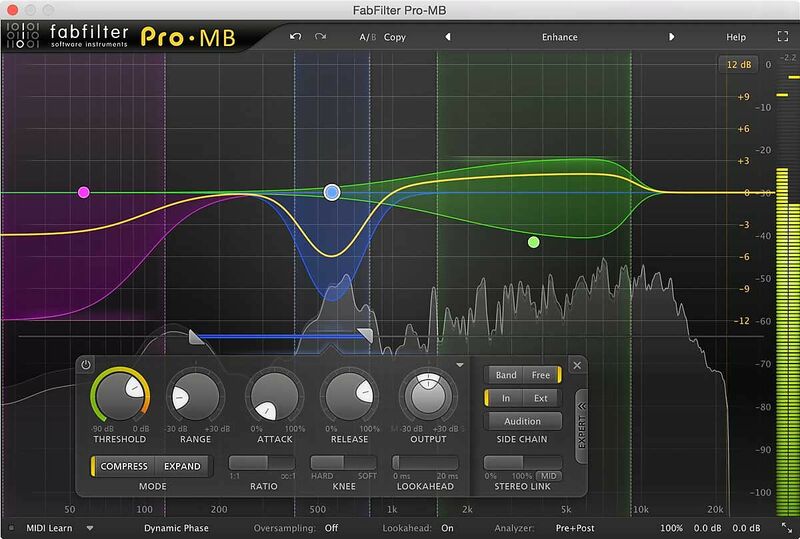 This is where multi-band compression comes into play. There are various multi-band compressors out there, Waves C4, C6, Linear Phase Multiband, hardware multi-bands, and various stock versions that come with certain DAWs. They all revolve around the same principle, but for the sake of this tutorial I will be referring the Waves C6, as in my opinion, it has the most flexibility, and sounds very musical and transparent when set correctly. A multi-band compressor is essentially a few compressors in one, but unlike a traditional full-band compressor, they are are frequency dependent. In the case of the Waves C6, it has six customizable bands that you can set at different crossover frequencies. So let's go back to the previous example. Instead of applying a static cut at 2500Hz, you can set one band there to attenuate that range only when it passes a certain threshold, or, in other words, whenever that area has too much buildup and needs to be attenuated. Applying a second band for that 350Hz muddiness to only attenuate when that frequency range is too much will similarly not affect the more balanced moments in other parts of the performance. That said, using a multi-band compressor will allow you to control issues arising from the performer's distance to the mic, parts where they are too loud or too soft, while also shaping the overall tone of the vocal sound. By killing three birds with one stone you will be using less processing for CPU reasons, and your vocal will sound more pure, having only run through one processor, instead of three or four. It may seem daunting or tricky to set, and can be at first, but if you spend time really listening to the various areas in the performance and train yourself to identify what areas need attention at what specific moments, you'll be well on your way to creating that big budget, natural vocal sound. Within the iZotope Ozone 8 Suite, available in Standard or Advanced versions.